Assassin’s Creed Odyssey comes out the beginning of October 2018. If you still find yourself craving some Assassin’s Creed or some Grecian adventures after you complete it, you’re in luck. Ubisoft has announced a new Assassin’s Creed novel. It will be an adaptation of Assassin’s Creed Odyssey and arrive on October 30, 2018. Told from the perspective of Kassandra, one of Assassin’s Creed Odyssey’s two playable protagonists, the novel of the same name will be a retelling of the game’s storyline. It will focus on key moments from the story, while also expanding on others. Ubisoft’s announcement says the novel will focus on “one of many possible paths the players take”, so it’s possible some players may not even experience the events it describes. Take a look at the cover art for the official Assassin’s Creed Odyssey novelization. As the book is told from Kassandra’s perspective, there may be moments not present in Alexios’ storyline. Assassin’s Creed Odyssey stands to offer the player more freedom than before, whether it relates to romances or how you choose to fight. Choosing to focus on one path players can take is an intriguing idea, and may ensure that the story being told will be fresh to many players. Raised in the forge of a Spartan upbringing, Kassandra ekes out a living as a mercenary on the isle of Kephallonia, where a tragedy has left her stranded for years. Riddled with debt, she’s offered a potentially life-changing mission by a mysterious stranger; thus begins an odyssey that takes her through the battle lines between Athens and Sparta, and into the maw of a conspiracy that wants to destroy her. The newest Assassin’s Creed novel will be written by Gordon Doherty, who has already written stories set during the Roman and Byzantine Empires, so this is familiar territory for him. 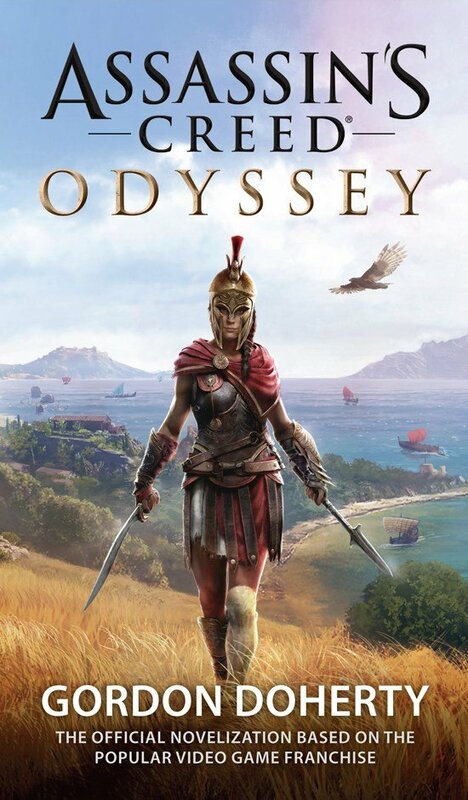 Assassin’s Creed Odyssey the book will release on October 30, 2018, and is available for preorder now. The game, on the other hand, will release on October 5, 2018 for the PlayStation 4, Xbox One, and PC.